Niamh Gallagher, Teacher; Teresa Higgins, retired Principal, Phil Roche, retired teacher; Marian Harkin, MEP; Mairéad Uí Raghallaigh, Learning Support Teacher; Pádraig Ó Beirn, Principal. MEP for Ireland North and West Marian Harkin has paid tribute to rural national schools and has said everything must be done to ensure that they continue to provide a service to their communities. 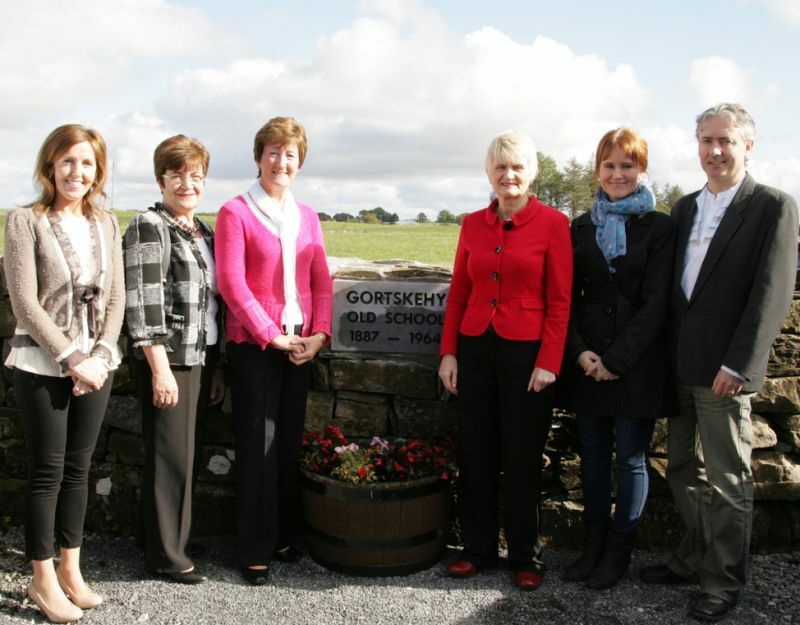 Ms Harkin made her comments when she unveiled a plaque earlier this month to mark the 125th anniversary of the founding of Gortskehy National School in South Mayo. She said she had been hugely impressed with the school’s achievements over the past number of years. “Before I visited, I was extremely impressed with the school’s website which lists its students’ achivements and progress in areas as diverse as sport and film, participation in the Cross Border Orchestra and the Young Scientist Exhibition in 2012”, Harkin noted. On the day of Harkin’s visit, the school welcomed teachers from Turkey, Romania, Austria, France, Italy, Estonia and Hungary – collaborating on a Euro-project entitled “Follow our Footsteps”. The Independent MEP said that “the sense of being rooted in the Community and the continuity of doing so for 125 years, the linking of the past and the looking forward to the future clearly showed the hugely valuable contribution that small schools can make to any Community”. Ms. Harkin said “the Minister for Education, Mr. Ruairí Quinn T.D., should be very wary of closing small schools in rural areas. The Minister for Education should visit schools like Gortskehy before he speaks of a ‘critical mass’ or ‘value for money’ in relation to the closing down of smaller schools. Having visited Gortskehy, I am absolutely convinced that the children attending this school will leave their primary education fully equipped to make their way in the wider world, proud of their local area, full of confidence, following a first class Primary Education”. Western People, October 16th 2012. Nestled in the heart of south Mayo, Gortskehy National School in the parish of Roundfort has been home to generations of local children since 1887. This year, the school celebrates 125 years of educational prowess and recently, Marian Harkin MEP visited the area and unveiled a plaque at the site of the old school.The anniversary celebrations coincided with the visit of representatives from across Europe as part of the 2012-2014 EU Comenius Programme. 18 teachers from France, Italy, Austria, Hungary, Romania, Estonia and Turkey – whose schools will carry out joint projects with Gortskehy as part of the programme – joined in the celebrations. Mother Nature was smiling down on the community for the occasion and blue skies provided the backdrop as the oldest past pupil present, John Hession, planted a tree with the help of the school’s youngest pupil Evan Gannon. It was a great day of historical commemoration in Gortskehy. 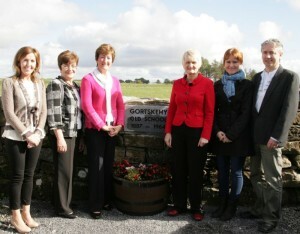 Past pupils and teachers gathered to mark the occasion while Carmen Cullen – niece of the famous late ballad singer and past pupil Delia Murphy – travelled from her home in Wicklow to witness the unveiling. Fr. Michael Murphy led prayers for all pupils and teachers who have passed through the school over its long history and there was a great welcome for Theresa Higgins, former principal, along with Phil Roche who retired earlier this year. Theresa and Phil served in Gortskehy for over 30 years and, undoubtedly, it wouldn’t have been the same without them there. The event also provided an opportunity for the community to welcome Niamh Naughton who was appointed permanent teacher in the school in September. Delighted to be part of the celebrations, the visiting teachers enjoyed a display of hurling and gaelic football and were thrilled to receive gifts of scarves, generously sponsored by Foxford Woollen Mills. Later, the celebrations continued in Delia Murphy’s Bar in Roundfort, where the pupils performed music, song and dance to the delight of all. Past pupil, Delia Murphy, recorded The Blackbird, The Spinning Wheel and Three Lovely Lassies for HMV, London, in 1939. 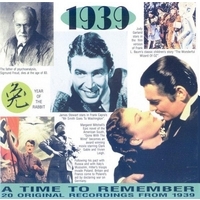 The Spinning Wheel featured on the album ‘1939 – A Time to Remember’ along with the timeless classic by Al Bowlly, Love is the Sweetest Thing. Both recordings feature in the above video of our 125th anniversary. We’re grateful to Justin (6th class) and past pupils James and Patrick for taking the video. Sincere thanks to Joe Queenan, Managing Director of Foxford Woollen Mills who generously sponsored Foxford scarves as a gift for our European guests.